This entry was posted on November 16, 2015 by Theresa Frassrand. 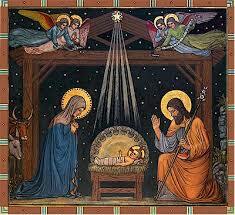 December, the month of Divine Infancy, celebrates the divinity and humanity of Jesus Christ. The pairing of words in this title is a reflection of the mystery of Jesus' nature. We each are one person with one nature. However, Jesus is one person with two natures. He is fully God and fully man, that is, He is 100% God and %100 man, not 50/50, or any other percentage. Jesus' Incarnation is one of the most important moments in history and its memorial is prepared for in the liturgical season of Advent, a four week anticipation.